May 2009 my sister was in town with her son (at the time, age 3). He really loves elevators - so I figured we'd take them for a quick tour of the Westin Bonaventure in downtown Los Angeles. 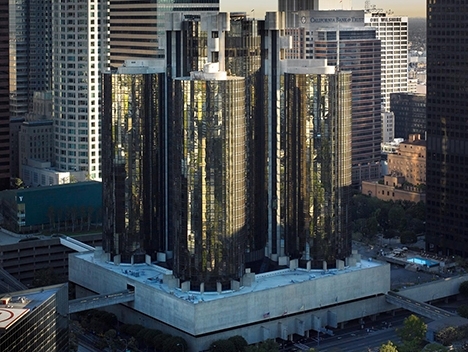 The Bonaventure opened in 1976 and - being in Los Angeles - has been featured in numerous films, TV shows and commercials. It consists of four 32 story round towers surrounding a slightly larger 35 story central tower. The top two stories consists of a restaurant and a lounge. Parking in downtown Los Angeles can be, well, pricey. Two hours parking at the Bonaventure would run $30. Yikes! If you live in L.A. and have a Los Angeles Public library card, you can get validated library parking across the street in the underground garage for only $1 for the first hour, and then $4 for each additional two hours (up to 3 hours total - after that, the rates go up significantly). Here's a link with more info. Don't forget to read the fine print! If you have any other tips on parking, esp if you're not from L.A. (and can't take advantage of parking at the Central Library across the street) let me know - I'll add them to this blog entry. I took a number of photographs inside the large open 7 story lobby - until I was approached by hotel security who asked me to delete the pictures and to refrain from taking any more. He was friendly, but firm. The building is one of the more recognizable buildings in L.A., so I guess the hotel is being extra cautious. But down at the street level, the building feels like a fortress. The two entrances are purposely hard to find, and there is little to nothing to see at street street level except a seventy foot high cement wall. It can be tricky finding things: the front desk, the pool, and the "sky bridges" that lead out from the second and six (or is it seventh?) floors to adjacent buildings. Above is the view from the sky bridge (going across Flower Street) to Bunker Hill. 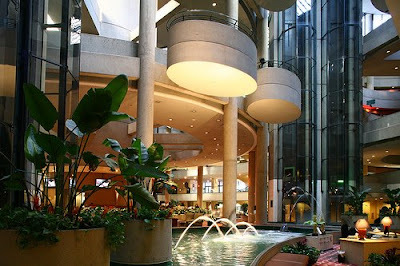 Still, the Bonaventure is an amazing hotel, and a great place to explore. If you stick to just walking around the lobby and asking any of the staff for help (including "what floor am I on?") you're fine. It's also a great place to stay. We had family members from out-of-town who (thanks to Priceline) stayed at the Bonaventure while here on vacation here - and loved it. 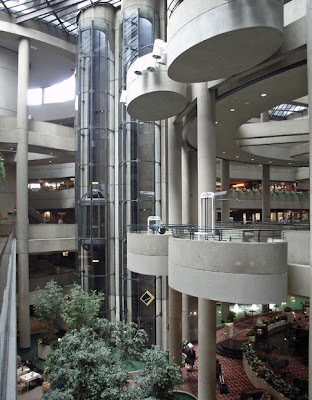 And the elevators. Can't forget those. That was the whole reason for our visit. Definitely an "E" ticket (in terms of elevators) and worth the ride. As you can see, they've got floor to ceiling glass. We figured going up and down once was probably OK.
וְדִרְשׁוּ אֶת-שְׁלוֹם הָעִיר, אֲשֶׁר הִגְלֵיתִי אֶתְכֶם שָׁמָּה, וְהִתְפַּלְלוּ בַעֲדָהּ, אֶל-יְהוָה: כִּי בִשְׁלוֹמָהּ, יִהְיֶה לָכֶם שָׁלוֹם. Our little downtown excursion continued with a stroll across the Flower Street skybridge toward the Wells Fargo Center on Bunker Hill. Turning around and looking southwest for a final look at the Bonaventure. We walked around downtown a bit, and ending up at the Los Angeles Central Library. It was very do able, even with three small kids (ages 3, 7, 9) in tow. Here's a link to Part II - this second half - of our little downtown excursion next week.